The training rooms are outfitted with modular furniture that is not only comfortable enough for day-long meetings, but also easily configured to suit the unique needs of each group. Floor mounted power outlets are provided below the tables, and allow attendees to easily keep their electronic devices charged throughout the day. 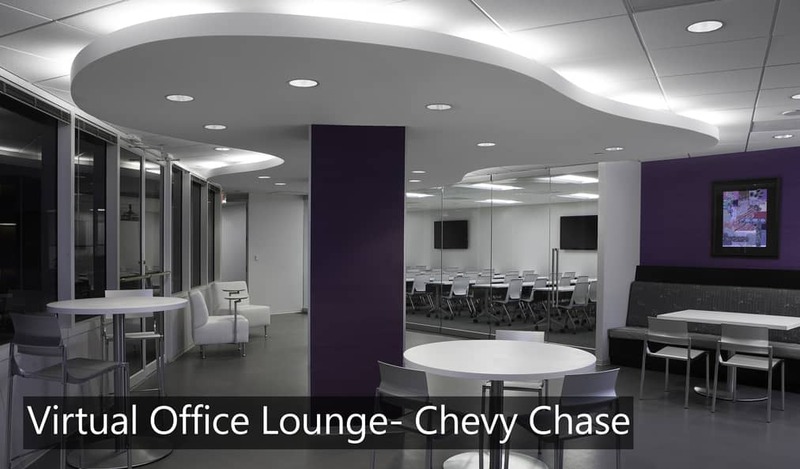 The training room at Chevy Chase is connected to our business lounge, which is divided by a sliding glass partition wall and allows for exposure to natural light and an atmosphere that feels spacious and airy. When collapsed, the glass partition transforms the space into one continuous area perfect for hosting private events up to 100 people. The ability to use the lounge and training room as either separate entities or one large combined area increases the value of the space to clients while also fulfilling consumer demand for one-time rental of large capacity training rooms that are affordable and non-hotel affiliated. For virtual and coworking clients who require a more private setting to conduct business, the training room at Chevy Chase is also connected to four workstations along with a private day office and small meeting room. The workstations line the hallway overlooking the atrium (which connects the lounge and the two private, closed-door spaces). This layout provides clients with a variety of options in one convenient location. The lounge also opens onto an atrium terrace, which has proven to be a popular spot for clients looking to host meetings or work in an unconventional environment. 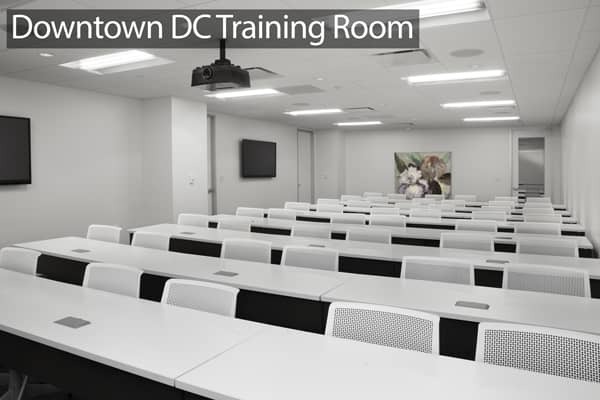 The Downtown training room is also attached to a business lounge and comes with its own private kitchen and interior office for one-on-one meetings. Aside from these details, both training rooms have private entrances and are designed identically. Along with the versatile structural characteristics of the newly renovated spaces, clients also find all their technological needs satisfied through integration of state of the art equipment throughout the suites. Highlights of both training rooms’ technological amenities are described below.